Zaha Hadid embraces USA as China rejects "weird architecture"
Zaha Hadid Architects embraces America as China turns against "weird architecture"
Business news: overseas architects are finding it more difficult to win work in China, according to Zaha Hadid Architects director Patrik Schumacher, as the economy slows down and the government tries to promote local talent. "I feel that there is this attempt by the Chinese leadership to try to make itself more independent and rely on its own talent," Schumacher told Dezeen, adding that the studio is instead picking up work in countries including the USA. "I know that there has been criticism in the media and critical voices in the cultural debate that China has been relying too much on foreign architects putting their foreign stamp on the skylines of China," he said. 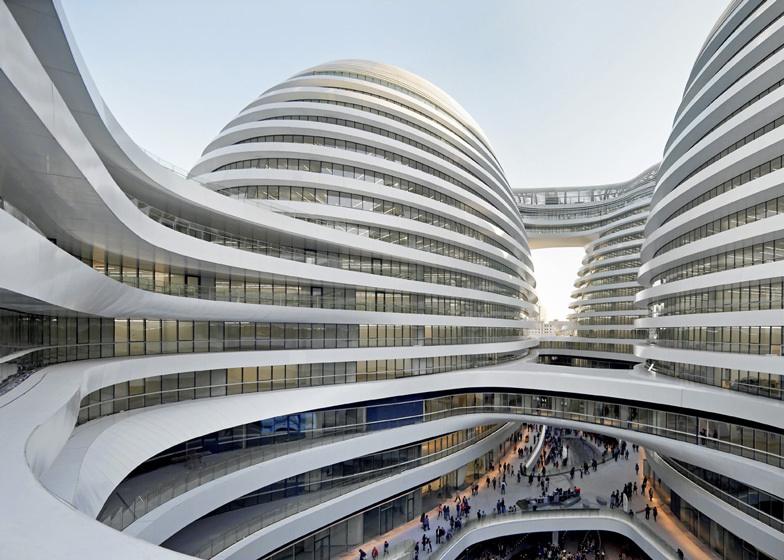 Zaha Hadid Architects has had a long run of success in China, delivering projects including Guangzhou Opera House and the vast Galaxy Soho development in Beijing. Earlier this year the practice unveiled designs for the world's biggest passenger terminal at Daxing near the capital with airport architecture specialists ADPI. However Schumacher said that having won the competition for the design of the terminal, the firm was no longer involved in delivering the project. "In terms of the overall contract set-up there isn't really any role beyond the competition," he said. "We have a budget to develop the interior architecture and the retail concept that was another tender, which we won. [But] it's uncertain who will be guaranteeing or standing up for the preservation of the winning artistic concept." He added: "There was this kind of worry about foreigners doing these kind of projects. The temptation to maybe to exclude them and let the Chinese come forward." Last year Chinese president Xi Jinping called for an end to "weird architecture" in the country and attacked projects including the Rem Koolhaas-designed CCTV headquarters in Beijing. Schumacher said the president's remarks had created a "ripple effect," with some clients asking the practice to tone down buildings and key competitions going to Chinese architects. "The debate from the central government in terms of criticising weird architecture caused certain ripples," he said. "It had some ripple effect on one of our current Beijing projects," Schumacher said, referring to a tower in Beijing that Zaha Hadid Architects has been working on. "There is a coincidence where for instance we were asked to tone down a little bit the exterior expression or rework it. It was precisely the time when these notions came out into the open and we did make changes and then we got planning for something more neutral." He added: "This was an example where you felt that this wasn't against foreign architecture, it was against unusual architecture." Some big competitions are starting to be won by Chinese architects, Schumacher said, and in others overseas entrants are being asked to team up with local design partners. When asked if it was becoming more difficult to win work in China, Schumacher said: "That is our feeling. Of course at the same time you can still see some of the construction boom has muted, with a lot of the damping down of residential projects. I think there is temporary cooling-off of the building boom in China." Instead Zaha Hadid Architects is turning to other parts of the world, particularly the USA, which is booming, Schumacher said. "It's picking up a lot," he said, reflecting the views of other architects and design brands who recently told Dezeen that the US market is "growing incredibly". "You can see that Manhattan is booming, so we have a number of opportunities and leads there," Schumacher said. "We have more work in Miami, we have a second tower underway there, we're competing in Chicago, we've looked at opportunities in LA, and these are all pretty much booming." He added: "We have to go absolutely global. We need to watch the globe because the boom-bust cycles are shifting around, there is political stability in some arenas, so we now realise we can only survive if we are totally global. If things stall in one arena we have to watch out that we still have things going on in other arenas."